Annette Emms is coming to talk to us on Gargoyles, Ghosts and Gravestones. 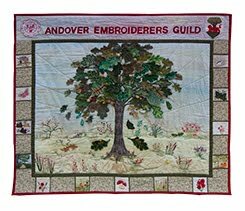 Annette says that parish churches are treasure houses, full of history and an amazing source of inspiration for textile art. Her talk tells of her many adventures 'church crawling' and describes how we might have fun discovering the wonders within and around our local church. She will show us where to look for ideas for art and where to find stories that will fascinate. Below are some pictures from her gallery.